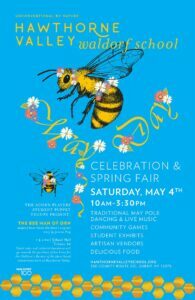 Each year on the first Saturday in May, Hawthorne Valley School celebrates the season and community with traditional dancing ’round the May Pole, games, food, vendors, music, children’s activities and more. The Magical Puppet Tree performs in the Morning Star Kindergarten Theater. *Tickets are $4. Ticket sales and collected donations will go towards the purchase of bee hives for the Children’s Garden of the place based educational work at Hawthorne Valley.